Jaipuria Institute of Management, Jaipur organized a Management Development Program (MDP) on “Accounting in Current Business Environment”. 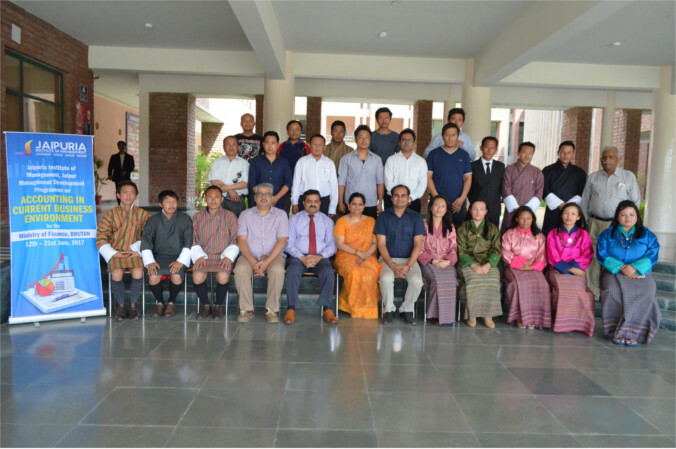 This 10 days’ MDP was attended by the officials of Department of Public accounts, Ministry of Finance from Bhutan. The sessions were filled with learning, knowledge exchange and frolic visits to ancient destinations of Jaipur and Agra. The Inaugural session was graced by Dr. Prabhat Pankaj, Director of Jaipuria Institute of Management, Jaipur with the lamp lighting ceremony for Goddess Saraswati. He discussed about the Mission, Vision and the Values and gave the complete insight about Jaipuria Institute of Management. The faculty expertise from Jaipuria Institute of Management, Jaipur facilitated various MDP sessions. Dr. Prabhat Pankaj (Director), Prof. Anurag Singh (Dean – Academics), Dr. Prashant Sharma, Dr. Bhupendra Singh Hada were the key facilitators. Industry Experts like Mr. Rajesh Joshi (AVP Genpact), Mr. Prasuon Tripathi (Group HR Head at Ginni International Ltd., Jaipuria Institute of Management, Ginni Global Ltd. and Jaipuria Schools) and Dr. A. K. Gupta (Former CGM RIICO and Director, Board of Universal Cylinders Ltd.) graced the program. The MDP worked upon the combination of knowledge enhancement and skill development towards the latest trends of account in current business environment. Sessions, full of hands on practice helped the participants to learn and acquire latest accounting techniques. The topics were Accounting Principles and General Entries, Preparation of Subsidiary Books / Ledgers and Final Accounts, Final Accounts with Adjustments Financial Statement Analysis, Fiscal & Financial Reporting. They were made aware about the latest trends in financial analysis and new techniques of financial reporting, Inventory and Receivable Management System, Cash Flow Analysis and Cash Flow forecasting. Participants were certified and valedictory was conducted in presence of Dr. Prabhat Pankaj, Dr. Anurag Singh, Dr. Nidhi Vashishth Dr. Prashant Sharma, Dr. Vikas Indoria and Mr. A. K. Tiwari.